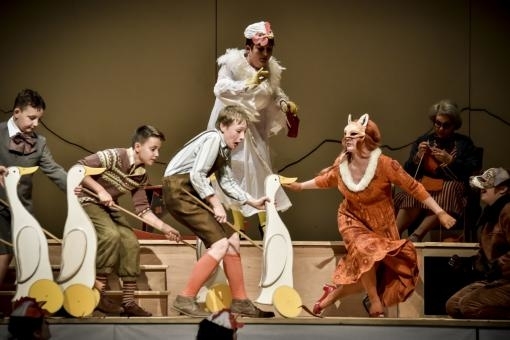 The international music festival Janáček Brno 2018 yesterday opened its sixth year with a new production of the opera The Cunning Little Vixen. The performance was directed by the artistic director of the Brno Opera Jiří Heřman, the stage sets were designed by Dragan Stojčevski, the costumes by Alexandra Grusková and the lighting was by Daniel Tesař. The role of Bystrouška was taken by Jana Šrejma Kačírková, the forester was Svatopluk Sem, Zlatohřbítek was played by Václava Krejčí Housková, Schoolmaster/Mosquito by Ondřej Koplík, Priest/Badger by Jan Šťáva and Harašta by Roman Hoza. The orchestra of the National Theatre in Brno performed under its chief conductor Marko Ivanović, who was also responsible for the musical production of the work. The sixth year of the Janáček Brno music festival, which opened yesterday and which will also be part of the celebrations of the centenary of Czech statehood, offers a genuinely top-rate programme made up of more than just Janáček’s music. Aside from the performance of the composer’s complete stage works in striking interpretations the festival as a whole will bring a number of accompanying events including among others performances of new operas by contemporary composers. This year’s festival will, in its extent, will undoubtedly be ranked among cultural events of a European importance. Furthermore, as noted by the director of the National Theatre in Brno, Martin Glaser, the festival’s importance does not lie just in the performance of all of Janáček’s operas on the centenary of the founding of the republic, but also in the notional entry of the reconstructed and newly reopened Janáček Theatre into the 21st century. The opera The Cunning Little Vixen Opera is among the composer’s most frequently performed works and is beloved by audiences. This tale brings together unbridled joy of life, Janáček’s undeniable humour and a certain gentle nostalgic melancholy. Some earlier production built their theatrical effect on the almost fairy tale theme while others accentuated the sensuality and eroticism finely interwoven in this opera. Capturing the Cunning Little Vixen is by no means simple and only a director who can balance on the border between the fairy tale and the real world without coming down on one side or the other, is able to find and highlight the magic of Janáček’s opera. Fortunately Jiří Heřman is just such a director. In Heřman’s interpretation there is sufficient space for humour, lyricism, fairy-tale dreaminess and pragmatic realism. At first glance in this production our attention is taken by Dragan Stojčevski’s stage sets, reminiscent of the interior of the Dagmar Children’s Home, founded by the author of novella on which the opera was based, Rudolf Těsnohlídek. The bare white with a crack along the whole length and the characteristic round windows of this children’s home in Žabovřesky represents a modern and refreshing element, which quickly and naturally is transformed into the impressive scenery of mountains and trees. Heřman makes exemplary use of this backdrop – insects swarm, chickens emerge from sheds, old wooden toys from the period of the first Czechoslovak Republic, the excellent costumes by Alexandra Grusková – all these taken together create a logical and sensitive visual whole. Also worthy of attention is the director’s work with light; aside from the relatively traditional shadow figures we should mention the images of the illuminated and translucent wings of flies projecting throwing outlines over the whole scene, accentuating even further the gentle dreaminess of Heřman’s production. The effect of this new directorial production is also heightened by the previously mentioned costumes by Alexandra Grusková, which occupy the border between the purely animal and human fashion. While the human characters keep to a more or less unified style of dress taken from the fashion of the period, the animals are given costumes that are much more colourful, although even here there is a clear attempt at a certain ambiguity, since many of the main animal character differ from people only in their masks. Another no less important pillar of the success of an opera production, not only in this work, is obviously the performances of the actors and singers. Although Janáček’s opera includes many characters from the animal kingdom, the main figures for most of the performance are the Priest, the Schoolmaster, the fox Zlatohřbítek, the forester and of course Bystrouška, the vixen. The casting of the main roles promised a successful musical experience. Jan Šťáva in the role of the Priest and the Badger had a firm intonation and gave an expressively rich performance, while Ondřej Koplík as the Schoolmaster was no less accomplished. While Jana Šrejma Kačírková as the vixen Bystrouška had at the beginning a slight problem with intonation and an odd heaviness in her voice, she managed after the opening few minutes to get her voice completely under control. She did an excellent job with the demanding text and unusual speech in Janáček’s opera, decorating notes only when it truly made sense and was justified. Compared to this Václava Krejčí Housková as the fox Zlatohřbítek lost a little in her diction and the influence of occasionally overdone vibrato reduced the comprehensibility of her otherwise successful singing. The true star of the evening was however Svatopluk Sem in the role of the Forester, who caught the audience’s attention not only with his velvet tonal colouring, faultless diction and richness of expression, but also with the quality of his acting. The singer introduced his gentle and dreamy smile even into the scene of the punishment of the vixen a strange playfulness that was more like a master and his pet teasing each other than serious anger and indignation. And with this concept Svatopluk Sem crowned Heřman’s production. The performance of the orchestra of the National Theatre in Brno was also of high quality under chief conductor Marek Ivanović with the minor exception of minor rhythmic discrepancies at the beginning of some phrases and the not completely precise horns at the conclusion of the opera. The musicians gave a balanced, rhythmically precise and dynamically varied and imaginative interpretation. And we cannot omit the excellent Brno Children’s choir under choirmaster Valerie Maťašová and the National Theatre Choir led by Klára Složilová Roztočilová. Aside from the chief conductor, Robert Kružík also took part as conductor in the production and thus had a hand in its final form. The Cunning Little Vixen opened the festival in an interpretation that this opera would deserve – on the borders between, gentle, fragile, rough, human, animal, dreamy and melancholy. Jiří Heřman and all those who were responsible for this new production managed to find a new staging that was at the same time a return to the past, with flashes of humour as well a quiet harmony.